The General Post Office, or GPO, is easily one of the top ten sights of Dublin. Not only does the massive classical building dominate Dublin's main thoroughfare, it also is the iconic symbol of Ireland’s failed 1916 Easter Rising. Every visitor to Dublin should stop and see the GPO. The historic post office is actually hard to miss because it is the largest building on O'Connell Street and can be found right at the center of Dublin's Northside. The impressive exterior is matched by a restored interior with plenty of brass and wood details. The striking building is one of the best examples of Georgian architecture in the center of Dublin and it is a true city landmark. While the GPO can easily be admired from outside, it is best to plan at least an hour to explore the new exhibit inside, which brings the history of Ireland’s rebellion to life. After years of moving from building to building around the city, Dublin’s main post office found its home on O’Connell Street in the early 17th century. The GPO officially opened for business in its impressive new Georgian building in 1818, on what was then known as Sackville Street. The mail business went on as usual for nearly a century until 1916, when the striking building in the center of Dublin was commandeered by Irish rebels fighting for independence. The GPO was chosen as the headquarters for the leaders of the Easter Rising, and on Easter Sunday of 1916 Patrick Pearse stood between the six ionic columns of the famous colonnade to read the proclamation of the Irish Republic. The rebellious group of intellectuals barricaded themselves inside the GPO, but they were under armed and outnumbered. Even though the Dublin General Post Office was chosen for its strategic, central location, the British forces soon arrived and shelled the structure mercilessly. The Irish rebels had too few weapons to mount much of a defense, let alone a counter attack. The GPO was almost completely destroyed by a fire following the Easter Rising and the only thing left standing was the stone façade. There are still signs of the artillery fire on the outside of the building, but the GPO had to be completely rebuilt by the new Irish free state government in 1929. It has faithfully served as Dublin’s main post office ever since. Dublin’s GPO a working post office to this day, so it is possible to walk in and admire parts of the interior Monday through Saturday. The office can be quite busy, and unfortunately, many of the paintings that once hung in the halls have been moved. For those reasons, the best way to visit the GPO is to book tickets to the special Witness History exhibit that commemorates the 1916 Rising. The museum is located in the GPO’s basement and tickets can be purchased online for €12, or at the museum for €14. The GPO’s Witness History exhibit is open Monday – Saturday from 10 am – 5:30 pm, and on Sundays and holidays from 12 pm – 5:30 pm. Visits to the museum are normally self-guided, but groups of 10 or more can book ahead to reserve a guided tour. One of the must-see pieces at the GPO is the famous Cuchullainn statue – which is only visible from the outside. The bronze sculpture was created by Oliver Sheppard and represents the death of one of Ireland’s major mythical figures. The dying figure of this fabled warrior pays homage to the rebels who died for Irish independence. At one time, this historic statue was the main thing to see inside the GPO. However, in honor of the 100-year anniversary of the 1916 Easter Rising, the post office created a museum in the basement, which is known as the GPO Witness History. The museum is dedicated to the weekend rebellion that has made the GPO a symbol of Irish nationalism, even today. Inside is an interactive exhibit, with a looping video and lots of original artefacts to help bring the Easter Rising to life. 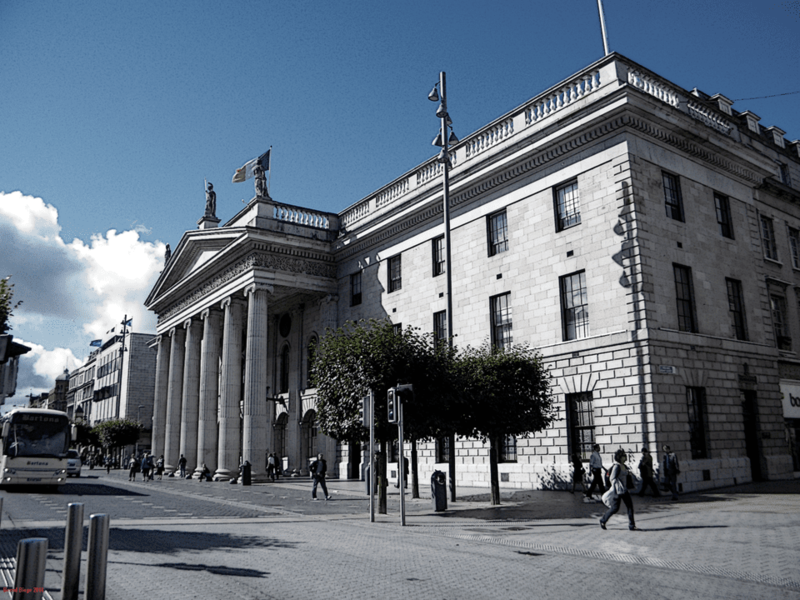 The newish museum and exhibits are the main attractions, but at the end of the day, the GPO is also still a working post office and the headquarters of An Post, Ireland’s national postal system. Pay a visit to the GPO’s Philatelic Office, where you can find commemorative stamps from recent years on sale – and they might even make for a unique Dublin souvenir. The GPO is located in central Dublin, so most attractions are a short walk away. However, the building is particularly close to the Spire, a 390-foot tall monument in the middle of O’Connell Street. The needle-like sculpture is built on the spot where Nelson’s Pillar stood until 1966, when it was destroyed by a bombing organized by the former IRA. The GPO sits on the corner of O’Connell Street (a main Dublin thoroughfare) and Henry Street – one of the main shopping areas in the city. This is the perfect place to indulge in retail therapy. St. Stephen’s Green is a short walk away and offers a lovely break from the crowds that congregate in the city center.